To deal with the challenges of the VUCA world, many companies experiment with shifting the idea of agility, as broadly used in software engineering practices in form of e.g. SCRUM to the whole organization. [J. Eckstein: ‘Company-wide Agility’, 2018] gives an overview of more than twenty different approaches for the agile organization. 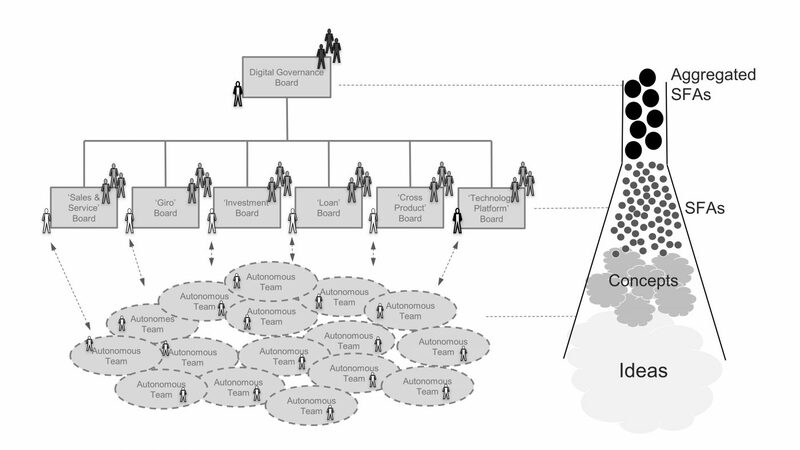 Browsing through these approaches, some of their proponents seem to propose that all decisions should be made decentralized by autonomous teams. Use the knowledge of the many and you will get the right solutions. But that is far from true. Grassroots democracy is not a model for companies. An organization pursues particular business goals dictated by shareholders, the autonomy of the employees is not its primary concern. Which application server software a company chooses to use is not a subject of general elections. All approaches proposing the agile enterprise do not take one thing into account: architecture. Building solutions in a sound architectural form needs common elements and ‘conceptual integrity’. This means that the concepts and structures of the business (capabilities, value streams, products & services, business objects) and IT (technology components) must play together in a way that maximizes simplicity, consistency, agility and thus business value.